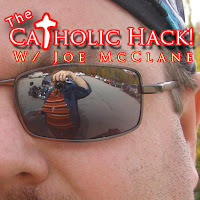 The Catholic Hack… Episode No 2 – Joe McClane | Catholic: Author, Speaker, Evangelist & More! Today was a good day… I was able to post my second podcast this week. This podcast, in particular, was very important to me as the topic is so huge. The secret to unlocking the Gospel… now that is a big promises. Download my podcast and tell me what you think. There are a few resources that I want to share with you as they relate to the topic of the show. The first is www.salvationhistory.com. This is an outstanding web site with a tremendous amount of resources available to everyone free of charge. One of which is an online study course, which I discuss in my show, which I want to point out. Check out : http://www.salvationhistory.com/online/intermediate/covlove.cfm. This is a course on An Introduction to the Biblical Worldview and the second lesson, of this course is my focus for today. Take a look at this lesson, as well as all the others on this site, and let me know what you think. This is great material! I want to also recommend “A Father Who Keeps His Promises” by Dr Scott Hahn. If you have ever struggled to piece the bible together in a fashion that makes sense then this is the book for you. This book helped me to see scripture and one, whole, complete, perfect book. Before this the Old Testament really made no sense to me at all and I viewed the OT as being completely separate from the NT. Well this is NOT the case. Read the book and you will know why. I also owe you a link to the Jewish Targum that I quoted from in my show…. Just go to the link for Gen. 1 – 6. Well I hope you enjoy this episode as much as I did. There was soooo much that I didn’t even mention that I really wanted to. I guess it will have to be the material for future shows. Well… please subscribe, leave comments, and tell your friends and family. May God bless you. The Catholic Hack Episode No 3 – Confession!